If you are building or remodeling, one of your most important decisions is your home's heating system. Radiant heat is efficient and cost effective. It could save you up to 40% on your heating bills. 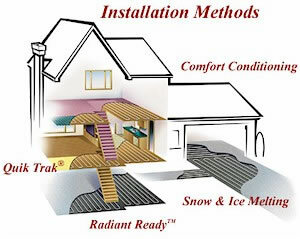 Radiant heat provides comfortable, even heat throughout your home, even in those hard-to-heat areas. Radiant floor heating heating heats your body and objects in your home's rooms - not just the air. The warmth stays around the floor area where it's most needed. Radiant heat does not use blowers that could disperse allergens and pollutants into the air. Perfect for homes with vaulted ceilings. Takes the chill out of cold kitchen floors, bathroom floors and unfinished basements. Ideal for new construction, remodels and retrofits; can be installed quick and easy. Works with any kind of floor covering! Extremely quiet, no noisy motors blowers or fans. Can reduce heating bills up to 40%, boiler runs at a lower temperature for radiant heat. The only effective way to warm tile or marble floors. 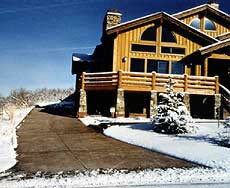 Can significantly increase the resale value of your home. Radiant heat technology can also be used for melting snow and ice from sidewalks, driveways and even outdoor athletic fields.